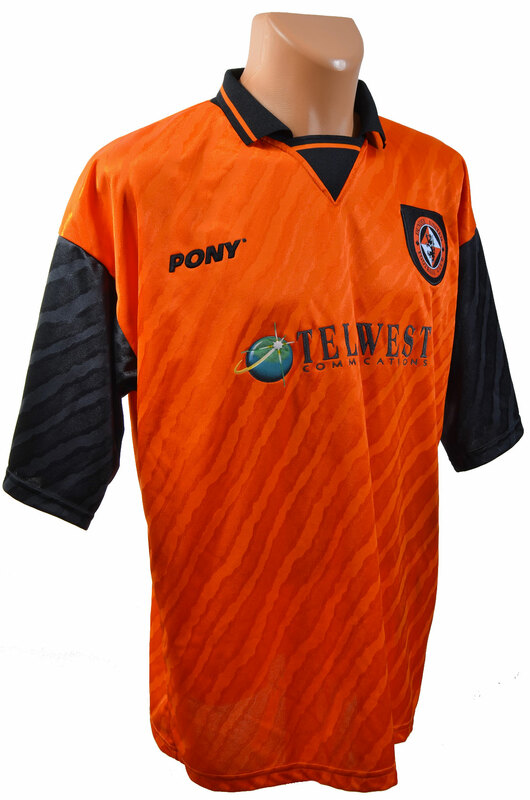 The Home kit for the 1997/98 season was a continuation of the Pony design from the season before, with just one small change. The tangerine Home shirt still had the diagonal tiger style stripe effect, the black sleeves, and the same 1970s style collar. The badge was also still the same, with the circular Club badge backed with a black shield background panel. The shorts and socks also stayed the same. The only change came with a modification to the sponsorship logo. After their one year deal came to a close, Telewest renewed their contract with the Club, and a larger logo was worn on the front of the shirt, this time with the black text and green sphere now stuck directly onto the shirt instead of the white background patch. The shirt with its new logo appeared for the first time in Andorra, where United’s UEFA Cup match against CE Principat took place in July 1997. After a slow start to Tommy McLean's second season, six straight wins in October and November had United flying high again. But two heavy defeats to Celtic - including a 3-0 defeat at Ibrox Stadium in the League Cup Final - seemed to really effect the team, with only 2 victories in the next 20 League matches. It took a 2-1 victory over bottom club Hibernian at Easter Road to make United safe and sent the Edinburgh down to the First Division. The Pony Home kits last appearance was in a 2-1 defeat to Rangers at Tannadice in the final Premier Division match of the season, a result which meant nothing as Celtic won the points they needed to win the title and stop Rangers from winning 10 in a row.